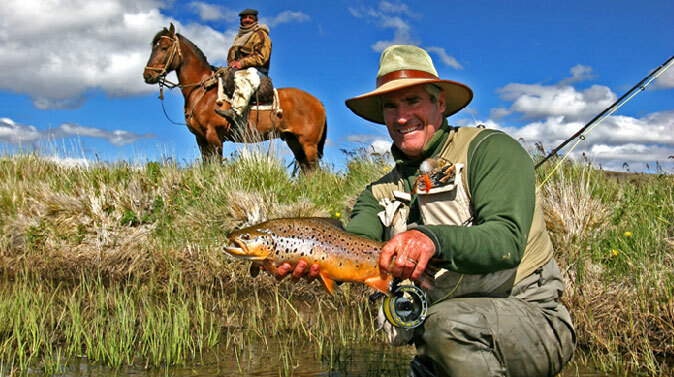 Fly fish chile’s s Estancia del Zorro high in the Coyhaique Alto mountain range on the Chilean-Argentine border, 23 miles from Coyhaique, Chile. 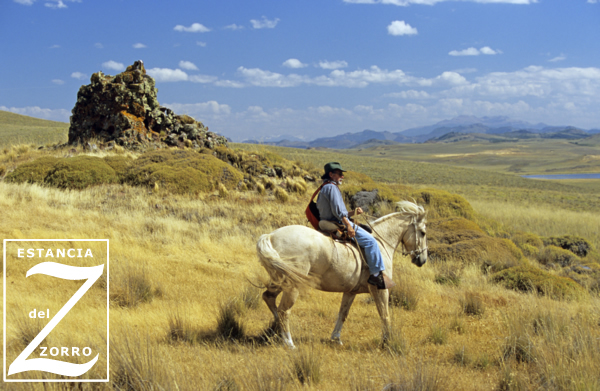 The 15,000 acre Estancia rests in the habitat of the red fox (zorro), the namesake of the Estancia. An abundance of condors, eagles, a myriad of other birds, and unexplored brown trout entice fly fishers and bird watchers to follow the trail of the red fox. 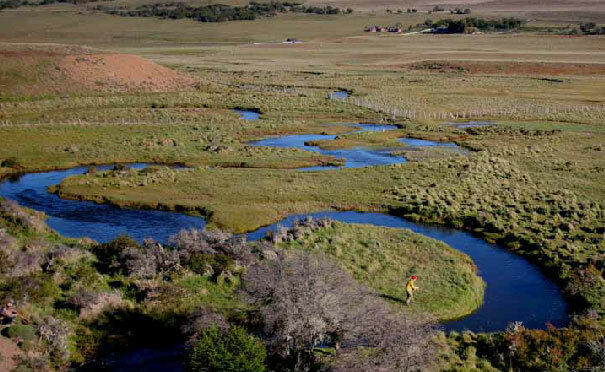 The main reason to vist the lodge and this are is the private spring creek has on its property and an adjoining Estancia (ranch) in Argentina. 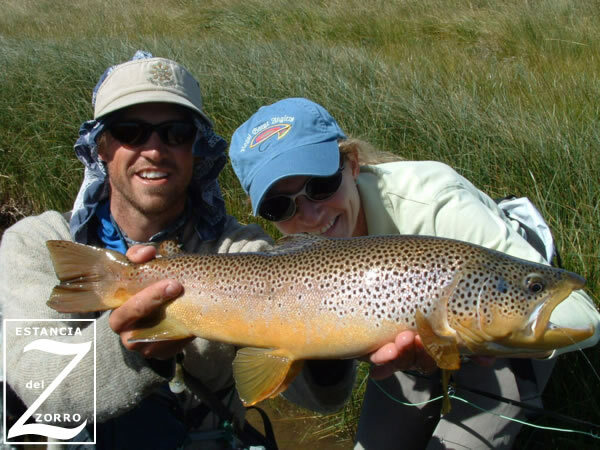 You can also combine trips with their sister lodge Cinco Rios to make a perfect 11 night 10 day fly fishing adventure of a lifetime. 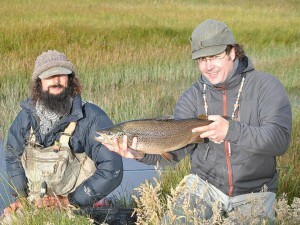 The scenery is spectacular, the trout are big and the food is good, what more could you want? Oh yeah.. they eat big dry flies all season long! 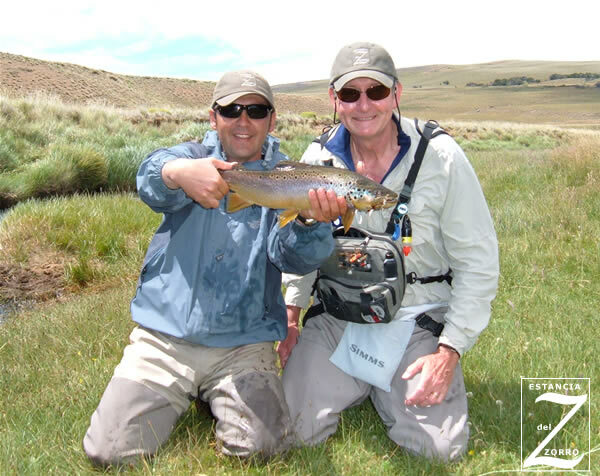 You and a knowledgeable, patient guide explore the hills, canyons, forests, mountains, pampas, and waters of the Estancia. 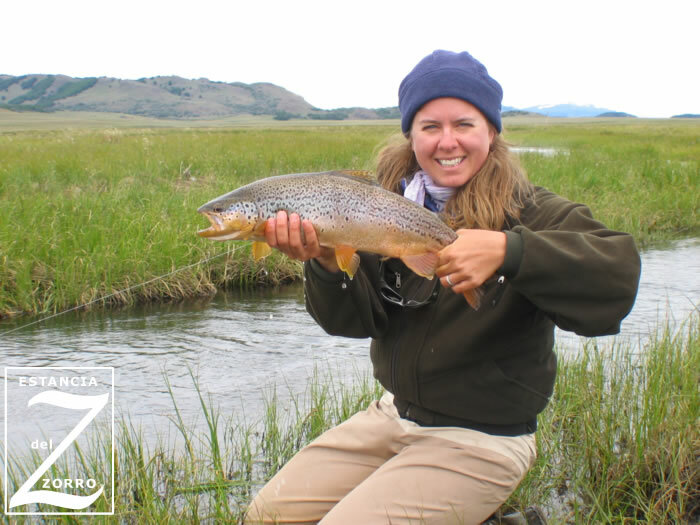 Your guide helps you fly fish for brown trout on two rivers and on a 15 mile spring creek with browns up to an astonishing 12 pounds, all within the Estancia’s private boundaries. 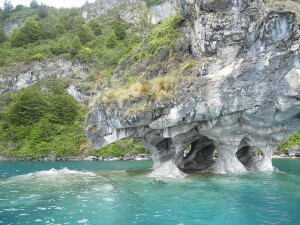 You will also explore other private waters in both Chile and Argentina on this trip. 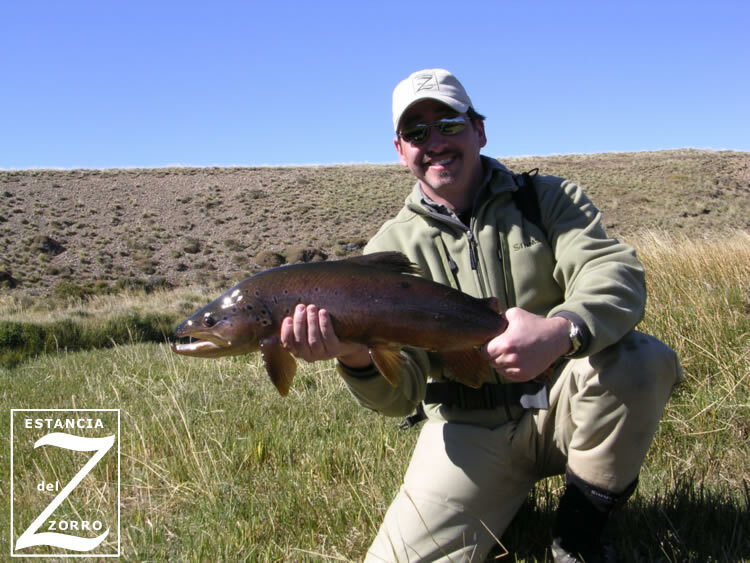 We combine fishing for resident brown trout on the Estancia del Zorro with fishing for rainbows on an Argentine Estancia as well as the Rio Simpson and other rivers and lakes. You fish one day in Chile. The next day you cross the border into Argentina With your bilingual guide. 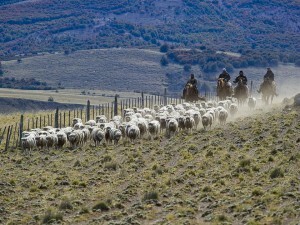 a Scenic 35-minute drive across the Chilean-Argentine border traverses the Argentine pampas to the river. On the road to the river, you pass some small ponds – prime habitat for swans. 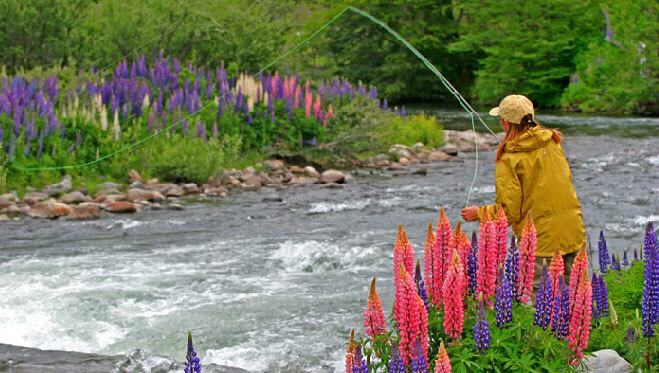 Fly Fishing Heaven in Chile. 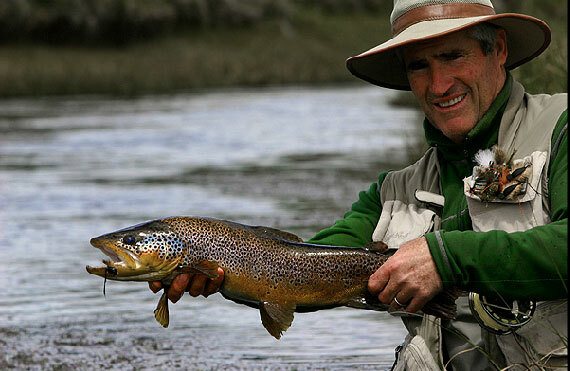 Due to the cool temperatures and prolific rivers in the Asyen region of Patagonia, the trout have found ideal habitat to live and reproduce. 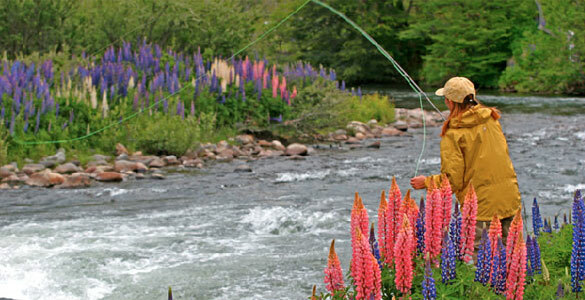 Lots of insects, lots of water and lots of big trout, this really is a paradise for fly fishing enthusiasts in Chile. 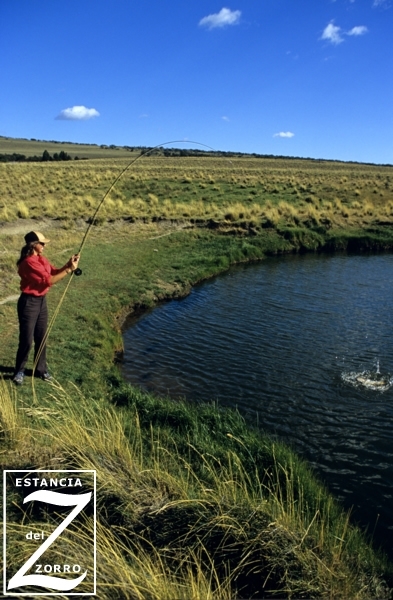 Each year the waters of Patagonia are calling fly fishermen from all over the world to an unforgettable experience at Estancia del Zorro. 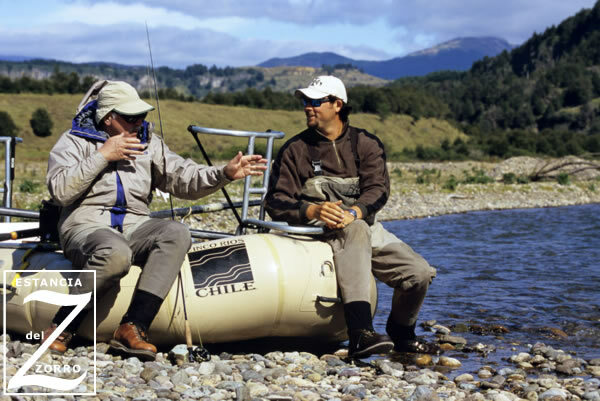 Coyhaique, the capital of the Aysén region in the heart of Chilean Patagonia, is the center of sport fishing in the region,and is not far from our Estancias. 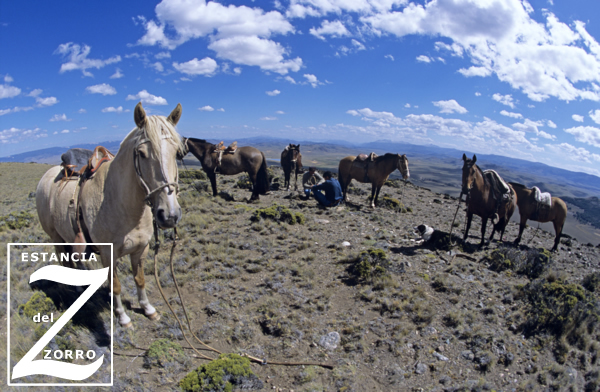 Estancia del Zorro is located about 15 miles from the historic town of Coyhaique. 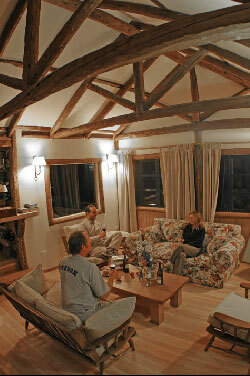 It is a full service lodge that can accommdate up to twelve guests each week. A main Quincho or Great Room invites guests to relax with a large fireplace and plenty of seating, a prefect place to swap fly fishing stories at the end of the day, and make plans for the next day’s angling. Also located in the main building is the dining room where both breakfast and dinner will be served. Breakfast and lunch are served here while lunch is served stream side. 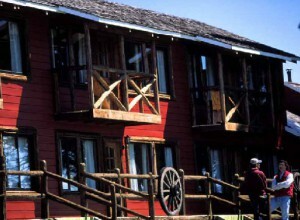 The dining room looks out over the Estancia as most of the lodge does. This is also where the guests prepare their individual lunches and meet for social hour after fishing. The guest rooms are large rooms comfortable rooms with queen or twin beds, sitting area and a private full bathroom. Each room has a beautiful view of the spring creek meadow below the lodge. Peaceful and secluded, this area is a bird watcher’s paradise for Andean condors, Chilean Southern-ringed kingfishers, eagles, ibis, torrent ducks, and parakeets. Tropical wild plants abound: bamboo, fuchsia, lilies, honeysuckle, nasturtium, lupine, and mammoth rhubarb only begin the list. 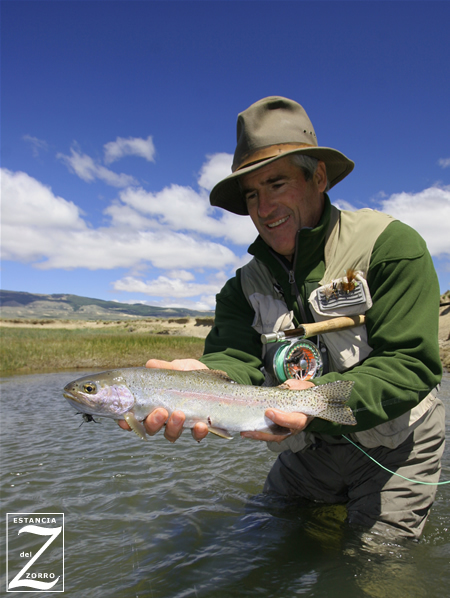 Nature’s wonders abound for fly fishers, photographers, and hikers. You encounter glaciers, tropical flowers pollinated by bees, and temperate rainforests without the dangers of poisonous snakes, spiders, and other creepy crawlies. Explore the city of Coyhaique with it’s woolen goods, other items, and historic places of interest. Each of our guides has many years experience fishing and exploring these waters. They are both native Chilean and Americans. We operate drift boats, rafts, 4 wheel drive vehicles and jet boats to take advantage of all the different waters we have nearby. 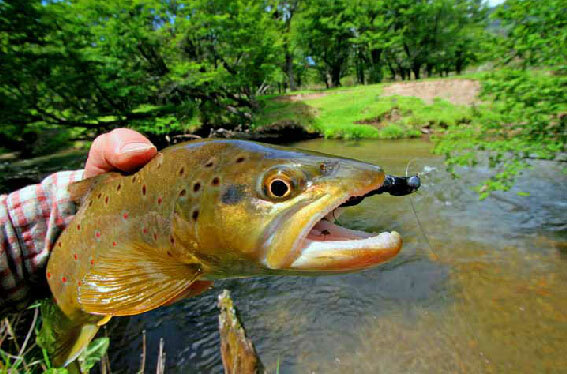 You’ll be walking 2 different 6- 10 foot wide spring creeks with some 3-12 pound brown trout population one day and drifting down the Simpson pounding the banks with big ugly dry flies the next, hiking through Argentina on a different spring creek the next! 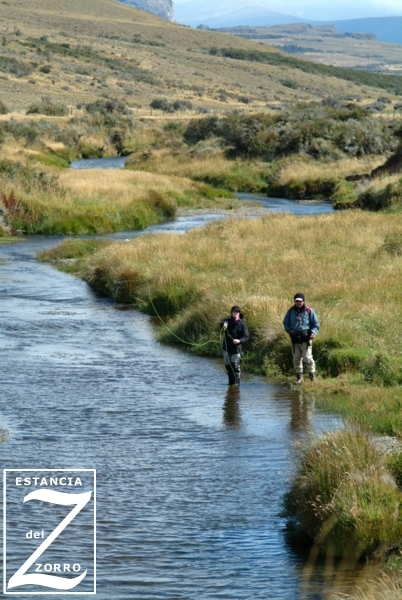 Streams and fishing in this area are within 30 minutes from Estancia del Zorro. 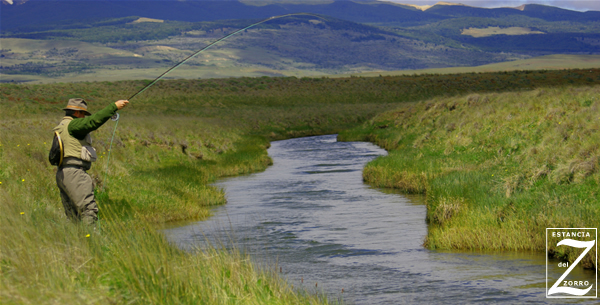 Many of the streams have seldom, if ever, been fished; some have been discovered only recently. 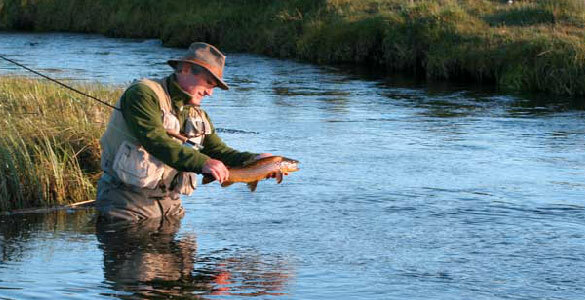 The streams offer diverse fishing; incredible, exciting dry fly action, sight fishing for big browns in tiny creeks. 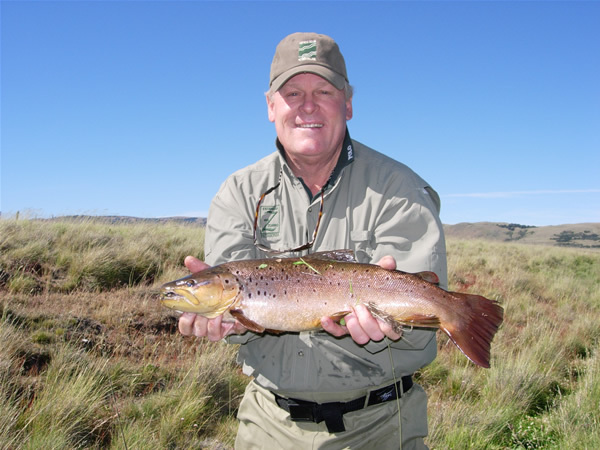 Some brown trout, only accessible by our jet boats because of limited roads, have never seen a dry fly. 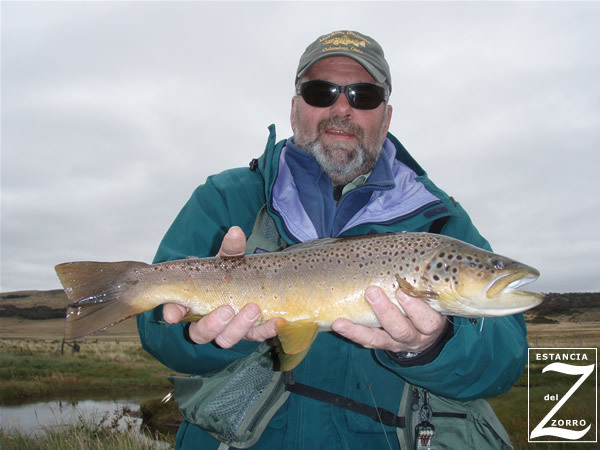 Large fish abound with many browns over 18 inches. Most fish are 15-20 inches but we land some 8 -10 pound browns and rainbows every week. 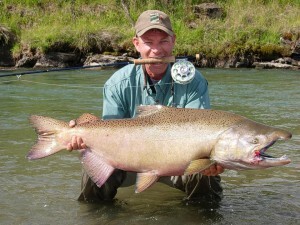 King Salmon and Silver Salmon have started to spawn and reproduce naturally in the rivers of the area and offer some great fishing towards the end of the season. The waters you will fish include streams, rivers and spring creeks, all located within the boundaries of the 15,000-acre Estancia or a short drive from the lodge. Many of these waters are seldom fished and some have only recently been discovered, producing diverse fishing conditions. 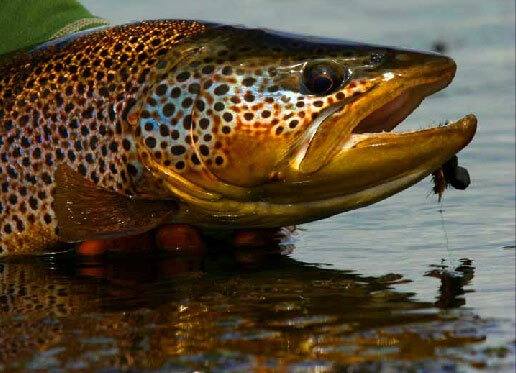 While some offer exciting dry-fly action, others require challenging sight fishing in pristine, crystal clear waters where fish can grow as large as 32 inches. 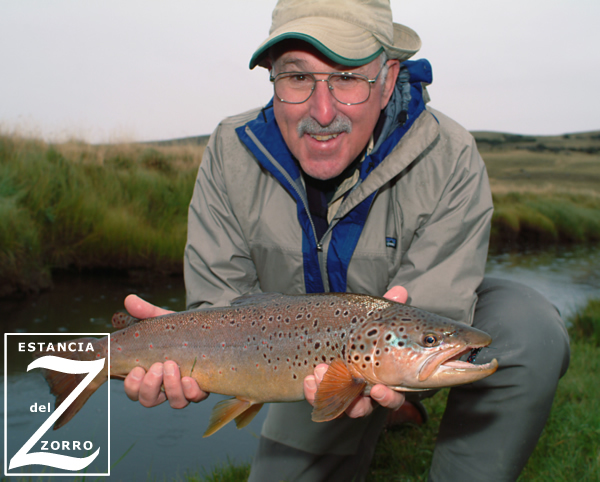 The Estancia Del Zorro spring creek, a mere 200 yards from the lodge, offers easy walk-in fishing for large, heavy brown trout. 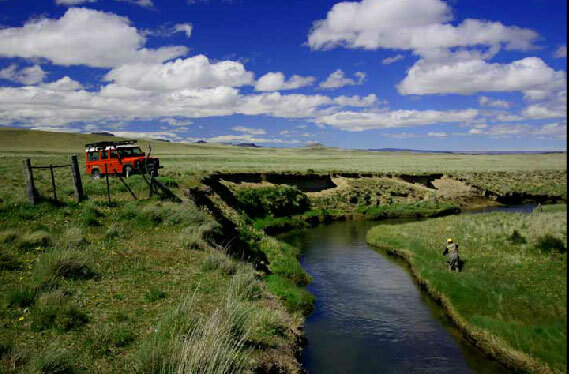 You will also have the unique opportunity to explore private freestone streams in both Argentina and Chile, two countries in one trip, reached by 30- to 90- minute rides by four-wheel-drive vehicles from the lodge. 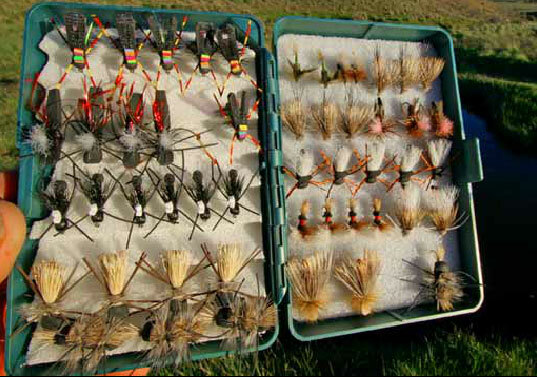 Finally, the Rio Simpson, the crown dry-fly jewel of the Coyhaique region, is yours to float just one hour from Zorro. 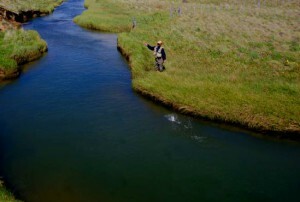 This river is divided into three distinct river types: the gravelly runs and pools of the smaller upper river hold large rainbows and browns, the middle stretches contain long gravel bars where king salmon spawn, and the lower river has long deep boulder-filled runs thatprovide some of South America’s best match-the-hatch fishing to large browns and rainbows. On your way to these nearby waters, you may encounter local huasos or ranchers driving their cattle or sheep along the roads or into the hills. 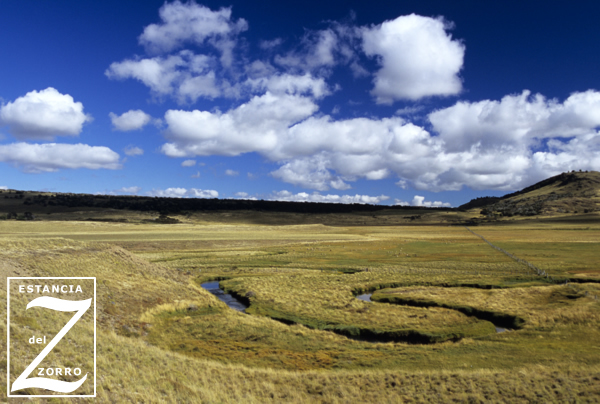 With these surroundings, you may believe you are lost in the South American wild west days of long past. The week is scheduled from Saturday to Saturday. Sunday being the first day of fishing, we start the morning with breakfast, which varies from day to day. Later, one of our guides will take you in a truck to the scheduled fishing beat. Every day you will enjoy exquisite lunches served on a beautifully arranged table, with good wines, soup, a main course and dessert which can be served on the bank of the river. Late afternoon we return to the Lodge so you can rest and recover for the next day. 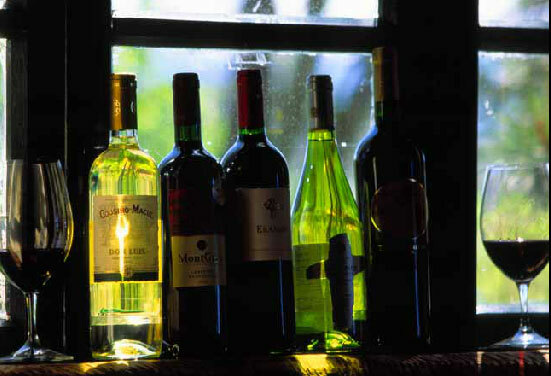 An exquisite dinner is held in the evening, with wine and an open bar included, the perfect way to end your day. 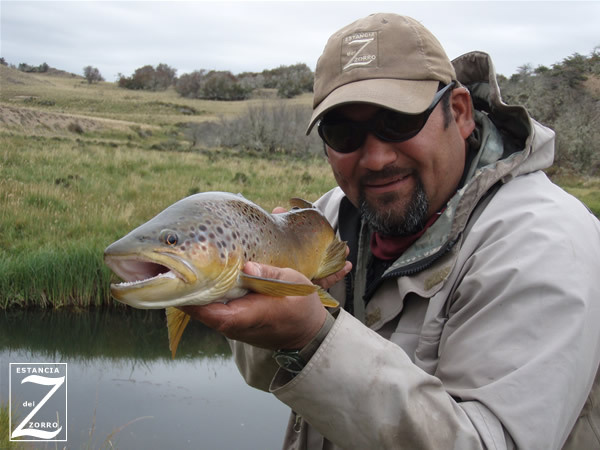 Prices Include: round trip ground transportation from Coyhaique or Balmeceda, Chile to the lodge, lodging, three meals a day, guided fishing each day ( for fishing packages),Soft drinks, beer and wine. It also includes all taxes. Prices quoted are per person and in US dollars. 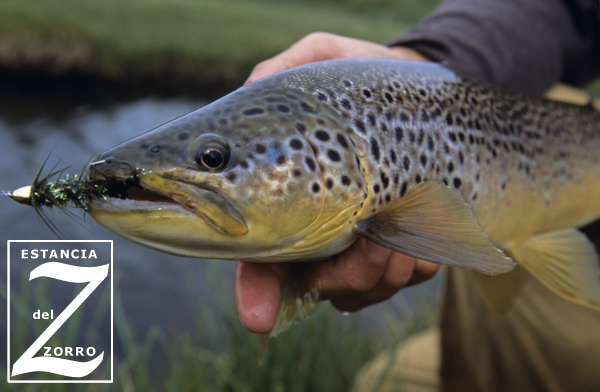 The fishing season officially opens in mid October and runs until the first Sunday in May. 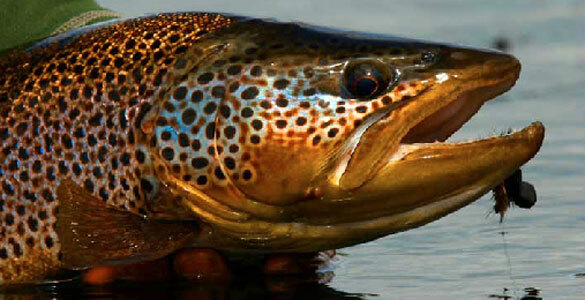 The best dry-fly fishing generally occurs from January to the end of March, although Nov. and Dec. are great spring months and very large trout on the move, generally taken on steamers, can make an angler’s dream come true. 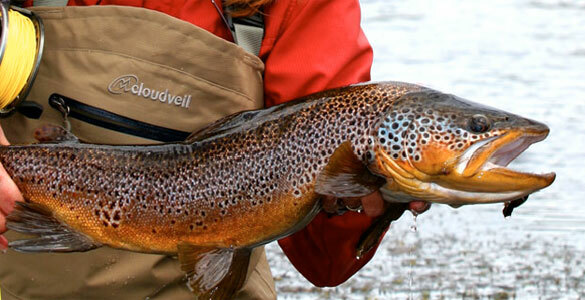 March brings cooler mornings and evenings and the rivers reach their lowest volume, but the cooler days bring the truly big fish out of the lakes and into the rivers for spawning. 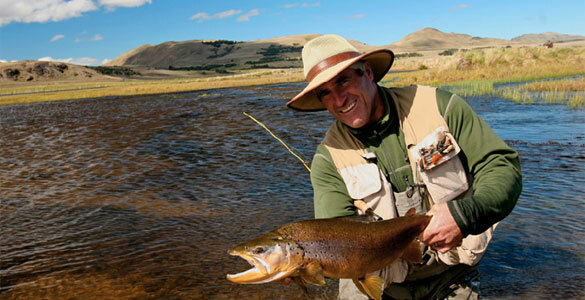 The pre-spawn streamer fishing can be incredible from mid March to mid April. 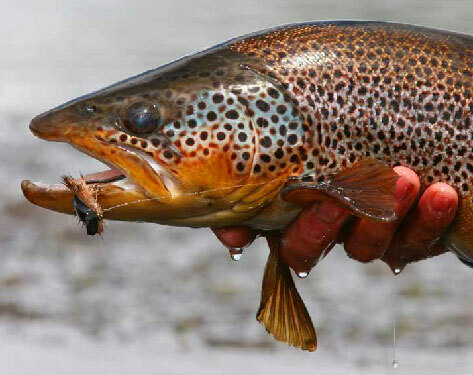 Those that want lots of big fish will endure fishing the shorter days in April, to have an experience of a life time going after very large trout with large dries. 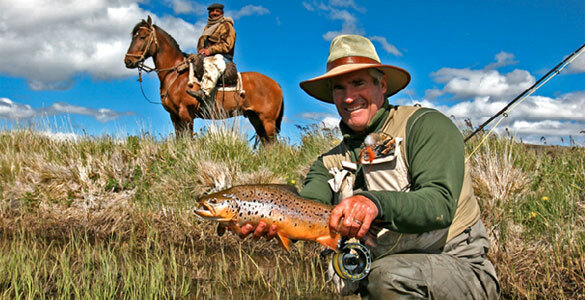 Please take a look at the photo and video galleries related Fly FIshing Chile’s Estancia del Zorro. Located about 220 km north of Coyhaique, we find the Queulat National Park, discovered in 1767 by a Jesuit monk Jose Garcia Alsue, who sought the mythical lost city of the Caesars. They are found on the General Carrera Lake, located in the town of Puerto Tranquilo, 223 kilometers (139 miles) South of Coyhaique. 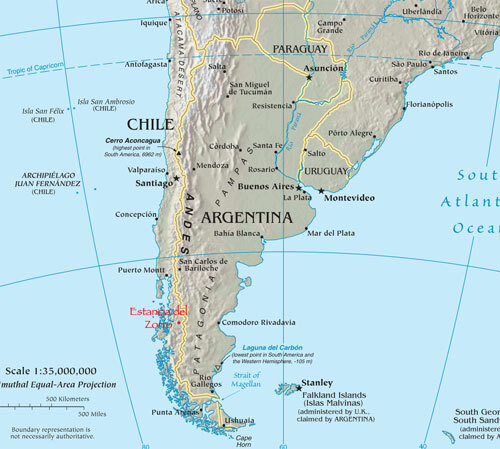 General Carrera Lake is shared by Chile and Argentina, but in Argentina the name is Buenos Aires Lake. 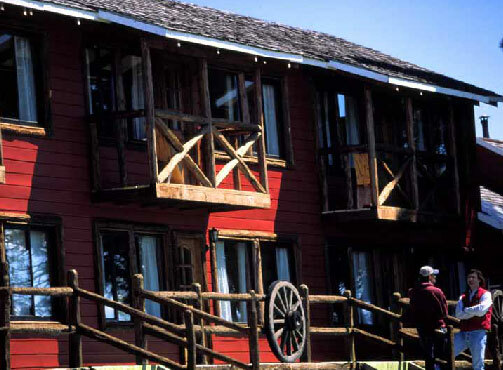 Located 45 kilometers from Coyhaique and in the Coyhaique Alto sector, the Estancia del Zorro allows visitors to enjoy a day out in the country where you can engage in different activities from our region. Cinco Rios Chile, may provide the visitor different trekking routes for the day, in which you can enjoy beautiful views of the region. Each of the routes to travel is unique and special. For those who love bikes, we can offer equipment renting as well as show you the best routes in our city or region in order to perform this sport. 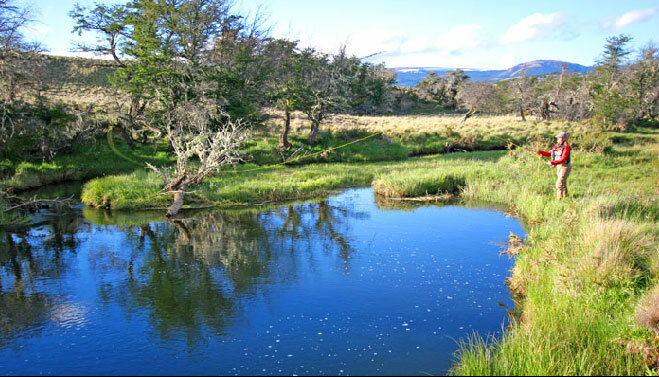 Cinco Rios Chile invites you on a journey to see a variety of birds in the wild. 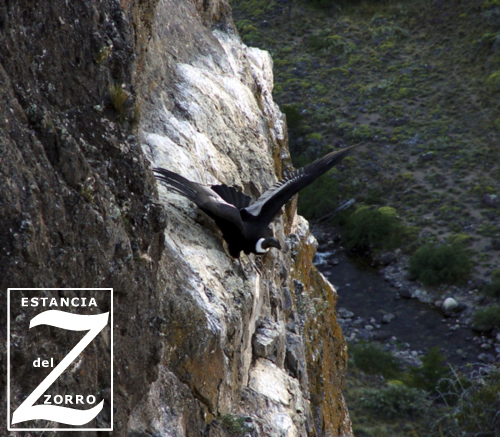 The beautiful flight of the Condor gliding through the Patagonian heavens captivates every visitor. Coyhaique, with more than 50,000 habitants charms its visitors. Founded in 1929, makes it one of the youngest cities in our country. 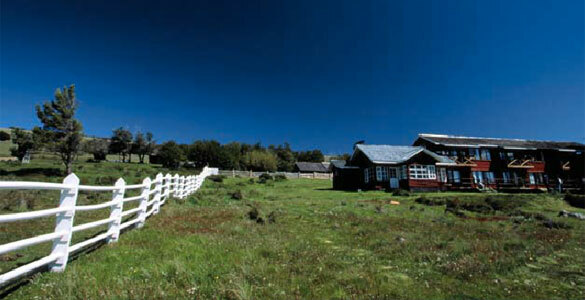 It is nestled in the mountains of the Patagonian Andes, near Cinco Ríos Lodge. 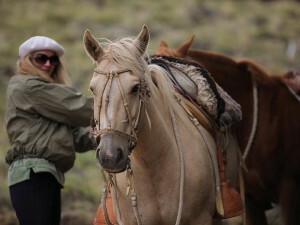 Horses are a way of life here in Chile. Ride with some real gauchos and help with a round up! Air Travel: Guests fly to Santiago, Chile and typically overnight there to relax and spend a day touring the city and its nightlife. 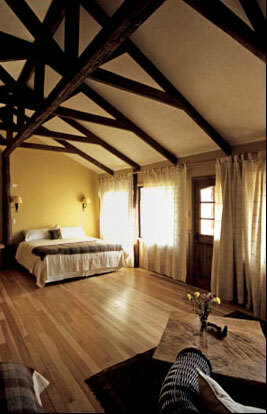 The Lodge can then be accessed from Santiago via commercial airline to the local airport of Coyhaique or Balmaceda. 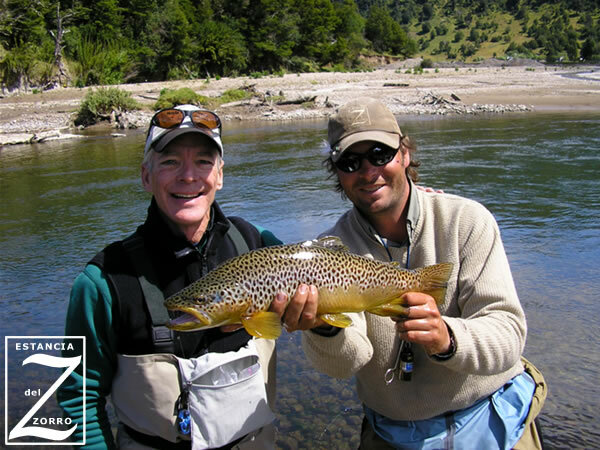 From Coyhaique or Balmaceda you will be transferred to the lodge, by a lodge representative, via a 20 minute drive.